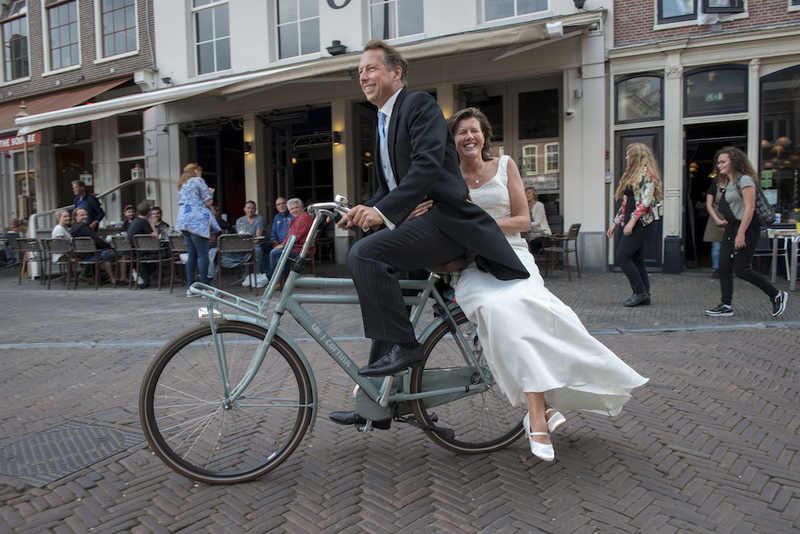 While in Amsterdam as a visiting professor at the VU University, Clay Small realised the superiority of Dutch culture when compared to the US is best illustrated by their attitudes to bikes. Sure there are differences in the size of our countries. One’s a socialist society, the other a capitalist bastion. The Dutch painstakingly preserve their 17th- century art and row houses while we remain ever ready to move on. So what if the Dutch citizens of all colours and creeds gel just fine? Hey, we’re working on our issues. No, the hallmark of our differences is in the attitude to cycling. We all know Amsterdam is a river of bicycles from sun up to sun down. There are more bikes than people in Amsterdam, where 67% of the citizens commute by bike daily. The bikes, like Amsterdam’s citizens, come in every colour and shape. Some are lovingly cared for, others look barely functional. Some bikes have large thick wheels, others tiny fold-up wheels for carrying up the office stairs. Many sport plastic crates on the handlebars for books or the day’s lunch. Others have saddlebags slung across the rear tire bumper. Like the unwanted flyers we find tucked under our windshield wipers, Amsterdam businesses go round fitting little plastic saddle covers with their logo and phone number to parked bicycles. Dutch cyclists like to multi-task as they pedal along: smoking, grooving to music, talking, texting, holding hands while ridding side-by-side, telephoning, singing and drinking. The one thing apparently prohibited for both adults and children is helmets. Their faith in the intelligent planning of their bike paths and their trust in fellow cyclists is so strong that for the Dutch, wearing a helmet would be a cultural affront. At rush hour the thousands of cyclists stream through the streets in tight formations. They rarely slow down. They abide by a series of mind-boggling rules of the road, glide along unfazed through relentless near misses, but remain, at least outwardly, happy and consistently polite. The steady rush of bikes weaving in and out looks like a video game compared to the reality of a normal American city rush hour. Dutch bicyclists appear to symbolise a better-organised and superior culture. The system works based on the peoples’ abiding mutual trust – not something in abundance in 21st century USA. My conclusion about a superior culture was based, in some part, on the fact that in my many trips to Holland I never saw a bike accident. That said, I have been shaken to my core by bicyclists. They whizz by, tranquil and insouciant, inches from my leg, scaring the bejesus out of me. Then again, all day long, cyclists calmly miss each other by even narrower margins. The citizens understand and, more importantly follow, the bike culture. Why wear helmets if there is no chance of an accident? The helmetless daring stands as the sceptre of a superior culture. Then, on my last night in Amsterdam, it happened. I strolled out of my Plantage neighborhood toward the Brouwerij’tij brewery and walked along an esplanade named Sarphatisstraat. Instead of a line of trees running down the middle of the esplanade there is a ribbon of mellow grass hiding the trolley tracks. To the sidewalk’s left was a soft green bank along a canal adorned with ancient weeping willows. It was a beautiful Amsterdam evening at 5pm and bikes were, of course, everywhere. I watched at a distance of 200 yards as two bikes prepared to cross from the other side of the esplanade, over the trolley tracks to my sidewalk. One of the cyclists miscalculated. The bikes’ frames clanged together, entangled and crashed to the ground in a loud, hard clatter. Immediately pedestrians rushed to the scene and numerous people jumped off their bikes to help. As I got closer it was clear both riders were hurt. A 10-year old girl was screaming and holding the left side of her head. There was blood. A Rastafarian man, apparently the girl’s father, was bending up and down from the waist, moaning and holding his shoulder. His daughter was comforted by an elderly woman with long, bright red hair wearing a full-length emerald green coat. She affectionately wrapped the girl in her arms. A middle-aged man in tweed, perhaps a doctor, guided the injured Rastafarian to a bench and bent over examining the left shoulder. Others attended to unraveling the bikes. The crowd around the accident site was calm and made sympathetic sounds. Since everyone was speaking in Dutch, I have no idea what was actually said. I stood on the crowd’s edge feeling useless. I hung around to admire how people of all ages and colours stopped to offer genuine help. It was a community effort. Twenty minutes later the pair regained their equilibrium, thanked everyone and began walking their bikes towards home. Despite the reality that bicycle accidents do happen, there is much to admire about the Dutch culture. It must be the bikes. After a 30-year career at PepsiCo, Clay Small is now a professor at Southern Methodist University in Dallas, Texas where he teaches at the Cox School of Business. His first novel, Heels over Head, will be published next year.